In this paper, we present a strategy for imaging measurements of absolute concentration values of gas-phase SiO in the combustion synthesis of silica, generated from the reaction of hexamethyldisiloxane (HMDSO) precursor in a lean (ϕ = 0.6) hydrogen/oxygen/argon flame. The method is based on laser-induced fluorescence (LIF) exciting the Q(42) rotational transition within the A1Π − X1Σ (1, 0) electronic band system of SiO at 231 nm. Corrections for temperature-dependent population of the related ground state are based on multi-line SiO–LIF thermometry utilizing transitions within the A1Π − X1Σ (0, 0) electronic band around 234 nm. 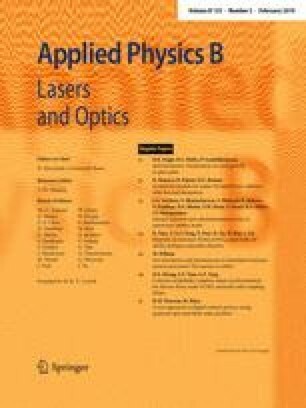 Corrections for local collisional quenching are based on measured effective fluorescence lifetimes from the temporal signal decay using a short camera gate stepped with respect to the laser pulse. This fluorescence lifetime measurement was confirmed with additional measurements using a fast photomultiplier. The resulting semi-quantitative LIF signal was photometrically calibrated using Rayleigh scattering from known gas samples at various pressures and laser energies as well as with nitric oxide LIF. The obtained absolute SiO concentration values in the HMDSO-doped flames will serve as a stringent test case for recently developed flame kinetic mechanisms for this class of gas-borne silicon dioxide nanoparticle synthesis. The financial support of this project by the Deutsche Forschungsgemeinschaft (DFG) within FOR 2284 (contract DR 195/17-2) is gratefully acknowledged. The authors also thank Torsten Endres, Siavash Zabeti and Usama Murtaza for fruitful discussions and supporting experiments.